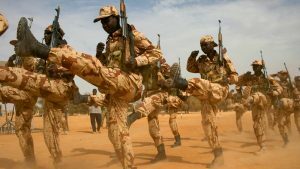 Saudi Arabia said it will donate $100 million to the special counter-terrorism force deployed by five African countries- Burkina Faso, Chad, Mali, Mauritania and Niger, known as G5-Sahel. The G5 force launched its first military campaign in October amid growing unrest in the Sahel, whose porous borders are regularly crossed by jihadists, including affiliates of al Qaeda and Islamic State. The force also aims at countering radicalization and human trafficking, two major threats to stability and security in the impoverished Sahel region, where Al Qaeda and associated groups have a significant presence, while the Islamic State militant group (ISIS) also appears to be staking a claim in the volatile region. The US for its part pledged $60 million in support of the UN-backed counterterrorism force, which has 5000 soldiers with a command in Mali. Written by: Jaber Ali on December 5, 2017.on December 6, 2017. Posted by Jaber Ali on Dec 5 2017. Filed under Gulf News, Headlines, World News. You can follow any responses to this entry through the RSS 2.0. Both comments and pings are currently closed.